When talking about the Aerospace industry your thoughts might quickly jump to the commercial airplanes sector. Of course the sector has a large share in the Aerospace industry, but there are some other very interesting and innovative aerospace projects worthwhile to take a look at. 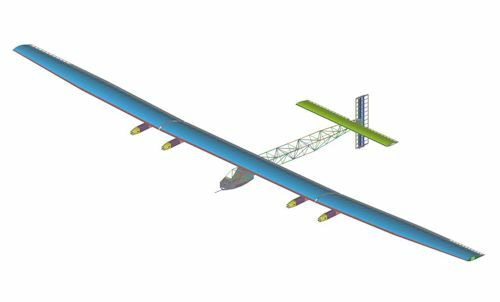 As part of our Femap in Aerospace series we’d like to tell you about the challenging project of the Solar Impluse group: to fly a solar-powered aircraft around the world without a single drop of fuel. Solar Impulse is an experimental solar-powered aircraft project, led by Swiss engineer and businessman André Borschberg and Swiss balloonist Bertrand Piccard. The first plane, or the Solar Impulse 1, flew an entire diurnal solar cycle, which was a 26 hour flight that included 9 hours of night time. But it was the Solar Impulse 2 that really amazed the world. It flew approximately 42000 kilometer (or 26000 miles) and was the first piloted fixed-wing aircraft using only solar power to fly around the world. Obviously to reach such an accomplishment a lot of challenges had to be overcome. The Solar Impulse 2 had to fly faster than the first one which meant the wings would have to withstand bigger loads. With the help of Femap, engineering analysts were able to optimize the amount of carbon fiber used. All material together, the plane weighed 2.3 tons, which is not much more than an average automobile. The aircraft had a wingspan of over 70 meters long and carried 600 kilograms of batteries! This lightweighting challenge while still meeting structural requirements for an around-the-world adventure was possible with excellent Femap application. If you are interested in the full case-study click the link bellow! Also if you have any questions about Femap, please contact us! We as Femap superusers will be happy to help you any way we can.